I’ve become leery of the labels “good” and “bad,” the checked boxes, the gold stars of approval. I’ve found it too easy to float on the surface of self-approval or loathing with the quick hit of “good” or “bad.” It’s a kind of shorthand that lets me glide over experience without more fully inhabiting it. For example, I was using a meditation app because I liked its bells. At the end of the session, I was asked to rate my meditation. It took me a while before I realized that having five-star meditation sessions is not the point of meditation. This constant ranking along the spectrum of good to bad is a bit of misplaced attention. You can think of it as a sort of junk food for the mind. It’s easy to busy oneself with tallying up how you are doing without really paying attention to what you are doing. It’s easy to be engaged by the comparing mind and lean on judgment and criticism rather than notice the nuance and contradictory texture of how life unfolds differently from moment to moment. Say you are visiting a restaurant with friends. You don’t want to subtract from the joy of being together by noticing the distraction of the waitress, the draft that keeps you fighting off a shiver and the limp, overcooked vegetables. You check it off as “good” as a way to protect the warm feelings of friendship instead of diving deeper into how it feels to be with pals in a substandard restaurant. Compressing experience into the shorthand of “good” or “bad” is easy. If you are an optimist, you can quickly edit out the discomfort. If you tend toward pessimism, you can fail to note the moments of grace and connection. The more I think about it, these labels really don’t describe anything. They are opinions, and they often block our ability to slide under the surface and unpack the experience with a more attentive curiosity. How did you feel? What unfolded that was unexpected? Are you happy because your expectations were met, or because life decided to give you a surprise? How would it feel to give up the check boxes of “good” or “bad” for a day or even just a few hours? Invited yourself into a more full description, instead of going with “my back feels bad in the morning.” Dug into the detail of it, noticed that it is impossible to put on your sock without sitting down. Became aware that moving to the right has more ease than the left. Or realized that you have a strong opinion about the aging process and that you’re angry about the loss of non-awareness of your back that you enjoyed five years ago. What if you gave up judgments and simply noted your experience? You might find it challenging to drop into a quiet place of simply observing your experience. Yet the accompanying storyline holds much information about how we paint the pictures of who we think ourselves to be or what reinforces our hopes or fears. Framing things simply as “good” or “bad” more often than not lulls us to sleep. Takes us away from the direct experience of our lives. Leaves us empty when we had expected to feel full. Try dropping the labels and put away the checklists and gold stars. See what is under the surface. Here in the dark of the year, when all of nature has slowed and stilled, is a good time to rest. But it’s not so easy for us with our electric lights, flickering screens and clocks built into all our electronic devices. All that makes it harder for us to feel the rhythm of the seasons, to listen to our biology, to surrender to the tidal ebbs and floods of the natural world. We live our lives as if sunrise follows sunrise, follows sunrise, follows sunrise. And then we wonder what happens to our vitality, why we feel distracted or anxious, and why our attention has lost the keenness of its edge. We easily fall into the illusion that more is better. And yet you know that when you have something really important to do tomorrow, tonight you’ll want a night of long restful sleep. Somewhere inside you know that your activity in life is supported by the counterbalance of stillness, quietude and rest. Take some time here in the dark of the year. Rest. Go into a fallow stillness. As every child knows, if you want to jump high, you must first squat down low. Sink into the dark of the season, which is nature’s way of providing restoration. And know that the cycles of nature will allow for an abundance of activity as we move back into the spring of the year. 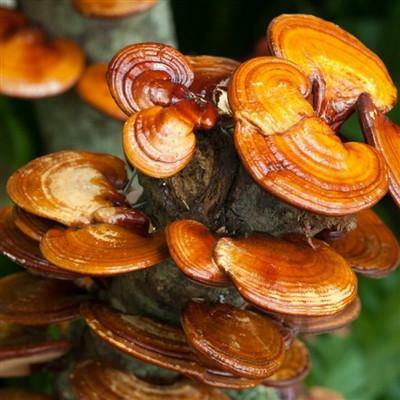 In the past, two medicinal mushrooms in the Chinese medicine pharmacopeia were consumed exclusively by emperors and those in the most elite classes of society. Reshi (Ling Zhi) and Cordyceps (Dong Chong Xia Cao) were both precious and rare. Today these substances still are precious, but no longer rare, as we’ve learned to cultivate them. Still, the quality and quantity of these mushrooms can vary dramatically from company to company. For my new podcast show, I recently interviewed Jeff Chilton, president of Nammex Organic Mushroom Extracts. I learned about how lab testing of the active elements of these cultivated mushrooms can be deceiving, depending on whether they are testing for polysaccharides or beta glucans. Here’s a link to a study that explains it in more detail. Also here is a link that will get you started on understanding the health benefits of medicinal mushrooms. At this point I’ve decided to buy these powerful medicines only from Nammex’s retail company, Real Mushrooms. Not only was the lab evidence for Real Mushrooms’ Reshi and Cordyceps compelling, but also when I tasted them, my body responded quite differently than it has from mushrooms from other companies. Here are some guidelines taking these powerful and safe medicinal mushrooms. For respiratory issues, asthma, chronic coughs, or adrenal fatigue, Cordyceps can be helpful. I’ve seen people with chronic respiratory conditions decrease the use of their inhalers, suffer fewer asthma attacks and lose their chronic coughs after using the mushrooms. Athletes in China have long used Cordyceps to increase their endurance. Please note that the changes that Cordyceps brings are not due to blood levels of a particular molecule, as with a pharmaceutical drug. This stuff actually changes and strengthens your physiology. So plan on taking it regularly for 4 to 9 months, depending on your condition. For chronic fatigue, recovery from surgery, cancer treatments, or other issues where the body’s vital energy is depleted, Reshi is the mushroom of choice. This mushroom does not target any one particular organ system. You can think of it as something that gives a bit of nourishment not just to your body, but to your mind as well, as this is also considered a spirit-calming medicinal. Please contact me if you have questions about these amazing gifts from nature. I stock them at the clinic, or you can follow these links* and purchase them from Amazon and have them shipped right to your door. * Yong Kang Clinic now has an affiliate relationship with Amazon. Using these affiliate links does not increase the cost of products from Amazon, and the clinic receives a small percentage of the sale for the referral. Thanks for keeping us in mind! Josephine is a Chinese medicine specialist who also is a friend of mine, and she loves hot cocoa. Here is her recipe for a sugar-free version of one of winter’s most delightful drinks. Mix cocoa powder with cold water to make a paste. Heat to bubbly. After simmering, stir in your favorite oil. Twirl it up with a stick blender (or use a regular blender) for 1 minute, to emulsify the oil. If you wish, add collagen protein powder. Blend for another 30 seconds. We are rolling up to the new year hand in hand with that curious practice of resolving we will become something we are not. This year, instead of deciding to become something you’re not, consider cozying up to a neglected or “outlawed” part of yourself. Most of us have aspects of ourselves that we dislike or hold in low esteem. It’s as though some of the unique parts of us are somehow suspect. Perhaps these aspects do not fit the image of who you want to be. It could be the crazy flip to your hair, the shape of your nose, the way your sensitivities prevent you from being a cutthroat competitor, how you need the dynamic stillness of nature to make sense of our human-shaped world, or how your introversion withholds a deeper connection with others. Yet maybe this disliked aspect is a gift, and we simply mistake it for a flaw. This year, instead of resolving to be something you’re not, decide to inhabit who you already are. Pick one aspect that you’re less than pleased about yourself and live it more fully. Instead of covering it over, give it expression. Show it off! After all, you are unique. We need a word for the sight that comes from holding the wide breath of your experience loosely enough to let the rejected parts have their say, to allow failure and accident to reveal hidden perspectives, and allow fluidity to soften the hardened stances wrought of pain, rejection and fear.